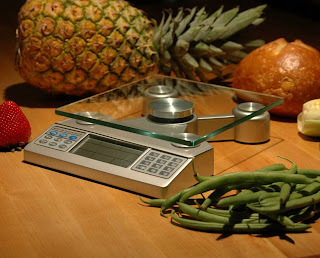 I'm in the market for a food scale, the more precise and expensive the better. Unlike most people, I don't want to weigh food that I plan to cook, but rather, that which I'm about to serve. Specifically, I want to make sure that everyone gets the exact same amount of root beer in their root beer floats, down to the milliliter. "That's not fair!" screamed Cortlen last night, pointing to his brother's glass. "Kellen has more than me!" "They look the same to me," replied my husband, before taking a big swig out of Cortlen's glass. "Now they don't," my husband observed. Cortlen catapulted himself off his chair. He writhed in agony under the kitchen table until I finally put him out of his misery and sent him to his room. "He had more! He had more!" Cortlen cried until he decided that having an ounce less carbonated beverage than his sibling was better than having no carbonated beverage at all. A food scale seems to be the most logical and cost-effective way to solve the problem of comparing/coveting in my house. If you have a more rational, time-consuming, or expensive solution, I'm all ears. I don't have any solutions, but you husband's assessment of the situation cracked me up! Ha... hysterical! Sounds just like my husband, he can't give the kids anything without "tasting" it first. Usually completely ticks off my 4yr. old to the point that he doesn't want it anymore... you know, 'Daddy Germs!'. But ironically it's my 9yr. old that cares more about quantity.. my 4yr. old is just happy to have it. Period. Now you have me craving a root beer float… they’re staples in our household too! oh.. and it reminds me too, of that peanut butter commercial where the mom lets the one boy cut the pb bread in half.. (obviously making one side bigger) But then the other boy gets to choose the half! Tricks on you! AT my house I just tell them that if something (aka boot beer float, or thomas the train or crayons) make you unhappy by having them, they will be ALL GONE. I have only had to take things away a few times and ta-da, no more complaints. We don't have this problem at our house, but plenty others. Just think buying a scale could be used as a teaching tool-math skills. You could have all the kids guess how many ounces are in things. Just an idea! We have a strict "he who whines goes without" policy around here. Like my Mom used to tell us all the time: I'm sorry I don't negotiate with terrorists. I love what your husband did. Oh boy do we have this situation. 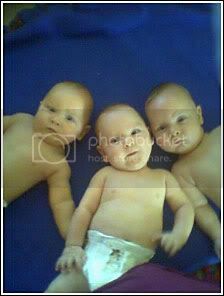 My last two have more enough sibling rivalry for the other four! Ugh. Once your kids get older and fight for the front seat, we just divide the days in the month by three (soon four) and whatever day it is, they get the front seat. Does that make sense? I like the "we don't negotiate with terrorists" plan. I agree...my brother and I had to do the * you cut the candy bar in half...I get to pick which half I want* It really works....the kids will be as fair as can be.. Funny how they never complain about having less squash or peas or beans than a sibling. LOL. And what's a day without a million fights about totally stupid things? I'm first in the camp of Daddy's solution: whine and go without--more for me! But when I don't have the energy for the aftershocks, I like the one person prepares/other chooses--and mine ARE old enough for that. On other things, we have assigned weeks (for "the good seat" at the kitchen table) or times (AM to school, T gets front car seat; PM home from school, H gets it). I find it all very annoying. Since I had 4 years between me and the next sibling, I don't remember much of this fighting with me, but I was also an ANGEL. HA! Maybe you should try that trick in the peanut butter commercial--one pours the rootbeer, the other picks the glass. That way they're always even. I can't get my kids to eat at all! I wish I had this problem. Love the ideas! I AWLAYS take a bite out of everything I serve to my kiddos and husband. I tell them that means I love them. My five yr. old was upset one day because I didn't take a fruit snack out when I opened the package. Later, I found out it's because he didn't think I loved him! I do this so I can help my behind grow faster, and also to make them "even"- smaller bites when I find I made the portion size too small, and bigger when I accidentally put eight chocolate chips on a cookie instead of seven! Hahaha! Every time I read your blog I chuckle out loud to myself. You are a funny lady! There were only two kids in my house growing up but my mom put an end to who had more quickly. One person divided and the other got first pick. Quite frequently rulers were brought out, M&M were counted out one by one, all in the name of being fair. Ok, all of that fairness was me. My brother just made two piles (or broke something in half) and then gave me the bigger amount. He would also give me his last bite if I finished first and whined at him. We have this sort of thing happen at our home OFTEN!!! We have 5 boys the oldest is 5 twins 3 and twins 1 (well next friday). I have been wondering for some time now on how to resolve certain situations - and I came up with this--- "SPECIAL DAYS"
On these special days it is there day to: Have more, choose the movie, get the "special day" plate, pick the game to play, WHATEVER it is that child's choice. I'll tell you what--IT WORKS!!! When there is a conflict I just have to ask "who's special day is it?" and the conflict is resolved!!! May not help with Root Beer floats but in other situations it's GREAT--- I even bought the "celebrate" plate from Pampered Chef!!! All my boys LOVE having dinner on the plate -- it really does make them feel "SPECIAL" ---- Good Luck! My husband told me that when he was little, his brother and sister and he used to have to split a soda three ways! They used a food scale to weigh the portions...and gave baby brother Jon the heaviest glass. Jon still doesn't appreciate the story and he's 24! Hmm, this is a good solution..I don't have this issue, yet so I'll have to remember this for my OCD son and my daughter who I know will eventually be like this! In our family we like to tell the story of Aunt Karen. Apparently when my mom and her siblings were kids they were having cake for dessert. Aunt Karen complained that someone else's piece was bigger. Because she complained, their dad made her eat the entire cake herself. She was, I imagine, quite sick and likely never complained about portion size again. Whenever my kids start to complain, I remind them of this story and threaten to make them eat the whole of whatever they're complaining about. Seems to do the trick around here. i kid you not, when my mom did stockings at christmas, she not only counted to be sure that everyone got the same number of mnm's, but she made sure all the colors were the same, too. she says it was to prevent fights on christmas morning, but there must be a little bit of her own ocd thrown in there to go through something like that for 6 kids on christmas eve! I just have to tell you how much I love your blog. I too come from a big family. (5 girls and 3 boys) I have 4 girls and just had our first boy 4 weeks ago.I enjoy how real you are. Thanks for keeping it real. Why is it SO incredibly comforting to hear other families have these scenarios? If I was a REALLY nice person I would be sorry that you and so many of your commenters have experienced this, but I'm DELIGHTED. My bad! My mum was a maths teacher so she definitely liked the "one divides and the other chooses" system with my brother and me. I have four kids though and it's trickier. The hyper-accurate scales idea may be a winner, though. I really like my food scale. Also cups with lids are good. I have tupperware ones. Do NOT under any circumstances buy a scale to make things fair and equal all the time. Use this as a training tool that life isn't always fair, agree with him, say "Yup your brother/sister has more than you do this time," then remind him about the last time he got more.